The £25 ($35) Raspberry Pi is to be manufactured in the UK for the first time, thanks to a hook up between Sony UK Technology Centre and electronics distributor Premier Farnell. It's a homecoming of sorts for Raspberry Pi – although it's a British enterprise, the hardware has always been manufactured in China until now because costs in the UK were too high. Liz Upton from the Raspberry Pi Foundation explained, "There was just no way to make the Raspberry Pi in the UK and keep the price at $25 for Model A (which will be released before the end of the year at the promised price) and $35 for Model B. Happily, things change." The site, based in Wales, will pump out over 30,000 Raspberry Pis a month, creating 30 new jobs in the process. As well as making the chip, Sony will also ensure only ethically sourced parts are used and maintain the company's green credentials. 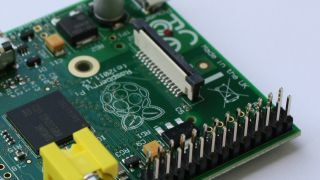 Eben Upton, the co-founder of the Foundation, added, "We had always intended and hoped that the Raspberry Pi would also be manufactured within the UK. "By bringing the production of a UK product back into the country alongside its development and distribution, we can help support our economy and demonstrate the capabilities the UK has in terms of technological innovation, invention, and manufacturing." Back in March, Raspberry Pi co-founder David Braben told us that component import tax made it impossible for the Foundation to make the device on British soil; it looks as though those problems may be solved. You'll know if your Raspberry Pi was made in the UK because those very words will be printed next to the power-jack.